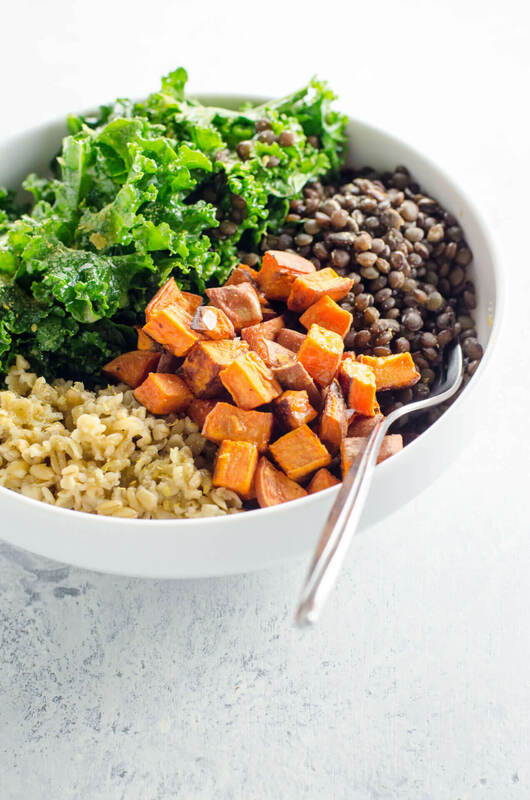 Say goodbye to that boring office lunch and say hello to this delicious Buddha bowl! It’s the perfect combination of sweet and savory, while providing you with the fiber and nutrition you need to stay full throughout the day. Preheat oven to 375°F with a rack in the center. Cut the sweet potatoes into 1/2-inch dice. Place on a sheet pan and toss with olive oil and some salt and pepper. Roast until lightly crisp on the outside and tender on the inside, 25-30 minutes. Meanwhile, place freekeh in a small pot along with three cups water and a big pinch of salt. Bring to a boil, then reduce heat and simmer, covered, for 20 minutes. Remove from heat and let rest for five minutes. Drain any remaining water. In a separate small pot, place lentils, herbs and a big pinch of salt. Cover with water by an inch. Bring to a boil, then reduce heat and simmer, uncovered, until tender, about 25 minutes. Drain remaining water. Strip kale from stems and break leaves into bite-sized pieces. Toss well with a few tablespoons of dressing. For dressing, combine all ingredients in a blender and process until perfectly smooth and creamy. Place some kale salad into each serving bowl. Arrange sweet potatoes, freekeh and lentils on top. Drizzle with extra dressing and sprinkle with nutritional yeast if you like. Recipe analyzed for 4 servings. Recipe analyzed with sprouted wheat in place of freekeh, 4 cups chopped kale in place of 1 bunch. Recipe analyzed without additional nutritional yeast, salt or pepper.